Brice with FLL 36321, Team W.I.L.D. When we're at a regional competition, it doesn't matter if we're talking to a seasoned member of a FIRST team or to a rookie, we can definitely feel their excitement and enthusiasm. 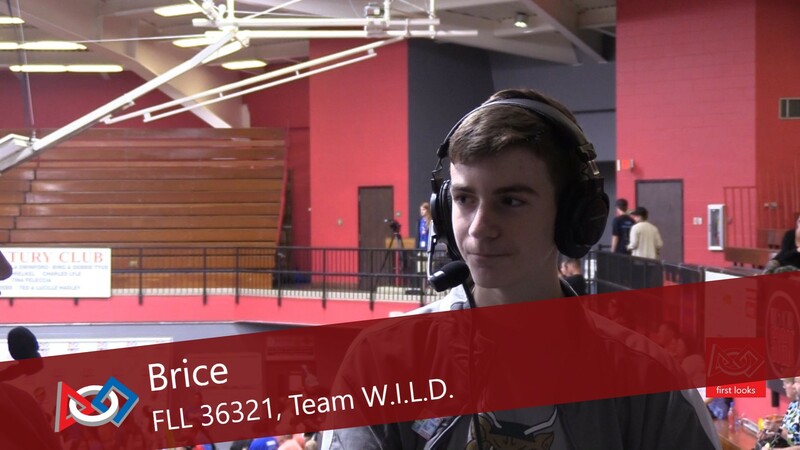 This was the case when we sat down with Brice from FIRST LEGO League 36321 Team W.I.L.D. And even when someone is new to the team, they quickly become an integral part of their planing an success. Brice is the main spokesperson for the team and also works a lot on the robot table and the project. He enjoys doing the research and finds it interesting how learning one thing leads to a lot more to explore. It's a lot of work but it's very fun. Although he originally found the competitions to be a bit intimidating, he quickly got use to it and realized how much fun they are. He really likes talking to the kids on the other teams about the theme and their different robots. He enjoys learning about their process and interacting with so many others who have common goals. Brice is currently in the 8th grade and he looks forward to continuing with FIRST and joining either FIRST Tech Challenge or FIRST Robotics Competition in the future.